I love this app, I use it on my iPad & Roku. Love the shows & functionality is great. I actually don’t mind the ads, I get it. But why on earth do I need to watch the same ad 5 times in a row?! That part is insanity. Does not work. Neither on my Apple TV nor on my iPad. Jumped through all the hoops, activated, and signed into my cable company. please Add chrome cast compatibility!!! I love this app and the shows it has to offer, but i can only watch from the phone. Most apps give you the capability to cast to a fire-stick or smart tv. Please consider doing this . For months I could watch this using my Hulu account and now all a sudden it’s restricted. Such BS. Why the change? Login, login, then login AGAIN! Would be good if you didn’t have to log into your TV provider every time you wanted to watch something. Even with Apple’s new single sign-on, it doesn’t work. Get it together. I am a Direct TV Now subscriber and I am not able to unlock the shows on my mobile devices. I can watch the unlocked shows online via the website, my fire stick and via Direct TV now app with no issues. For some reason when downloading the app to my mobile devices, it won’t work. It worked before. This is my favorite channel and I can’t watch it on the go because the shows are still locked even after logging in. Highly disappointed. It used to be good, and the recent app redesign is a big improvement. BUT - they totally broke logging in with other services (I use Hulu) and now all shows are locked and can’t watch live. Gives dumb “invalid mvpd/requestor combination” error when trying to watch anything now through the app. The app is now totally useless. Don’t use. Watch a different channel that actually works. I was half way through Season 5 of Fixer Upper using my Directv Now login credentials only to be locked out with a message saying “Your DIRECTV NOW settings do not include this content. Invalid mvpd/requester combination.” BS!!! I find this app annoying compared to any other app I use to watch movies and shows. The top bar data such as date, time, & battery status remain on the screen the whole time watching HGTV! There isn’t an option to make the screen wider to remove that from the view. After updating we now don’t get the Apple TV icon. So I screen mirror it and the resolution is low, it stops and starts, and sometimes shuts down entirely. I should never have updated to this version. 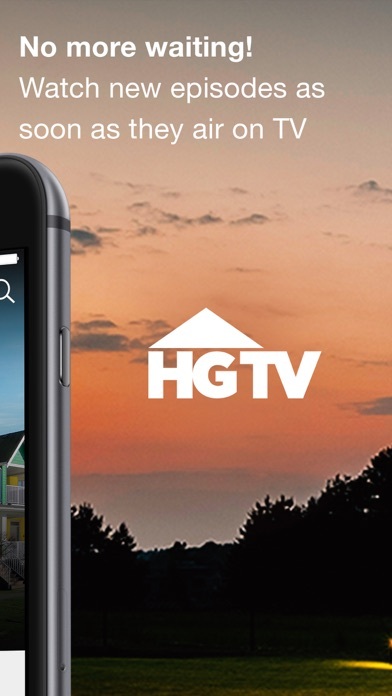 If you like watching the same commercial over and over, then HGTV apps and online version is the thing for you. The worst thing about the app is when a commercial comes on and starts skipping, by the time it comes back on, you’ve watched them cycle twice, I try to watch on lunch while I’m at work to unwind and break up my day but it usually leaves me more frustrated than I was before I went to lunch. They just don’t fix the commercial issue, it will replay ALL of them so instead of a quick break and back to the show it ends up being 6 mins or more of the same commercials cycling over again. Just freeezes! Can’t say it’s my internet, doesn’t happen while watching the show, only during their commercial run. Also happens when I watch it on the desktop. In 30 mins I usually watch 20 mins of commercials and frozen screen and only 10 mins of a show. Can’t even get through one episode during lunch. I have NEVER been able to do that. Also would love to see the old shows come back like designed to sell, hidden potential, not the one that they have now, the original episodes when it first came out. Bring back some Sandra Rinamato and Suzanne Whang too, love those old school episodes. Doesn’t work when you log in with your provider,👇🏻 Out !!! Too much ads . Almost feel like been tortured 😖. make the app paid but STOP these ads . Or atleast less often . Auto Play is killing me! This app starts the next episode before the episode you are watching is over. I spent 21 minutes watching the show and they always leave the outcome for the last minutes. If you try to go back you will have to sit through the same commercial block. Such bad app design. All of their shows save the outcome for the last few seconds. The app designers obviously have never watched an HGTV show! I have loved watching fixer upper, property brothers, and all of my other favorite hgtv shows on the app for the past couple years. After they gave the app a new layout and look, it just hasn’t been working. When I try to click the key to sign in, it won’t load and when I try to click on an episode it also won’t load!! I am debating uninstalling this app but I am waiting to see if the glitches improve. Hopefully they do because I’m on my last strike! Have checked for updates, reinstalled, etc. and app closes seconds after opening. We use this app to watch shows on demand through our direct tv now subscription. It is difficult to get it fast forward or rewind. I don’t mind watching the ads but it’s frustrating to watch the SAME SIX ADS at every commercial break. What happened to the cast button? As soon as I updated the app on my phone the cast icon is no longer available. Anyone else having the same issue? Why do people have to keep signing in? Commercials are very repetitive and app crashes quite a bit. It’s also painfully slow to load. The two of them make this show beautiful. The app is very glitchy and doesn’t respond at all times. It tends to freeze and logs me out randomly. Sometimes I have to delete the app and install it again to get it to work. I was super excited to see that I could get all episodes and seasons on demand for my favorite shows until I actually started using this stupid app!!! It’s so touchy and I swear it has a new annoying glitch every couples of weeks. Last week it started to just pause right after the commercial was over and I couldn’t press play to get it back to where I it had stopped. So every single time I have to stop casting, close the dumb app, re-choose the episode and try to manually drag the bar to what time I need it at. However, it redoes that 1 min and 60 sec ad over again even though I just watched it and then often it will then pause and not work again once the ad is done or it will jump ahead to a place I didn’t ask for! Today I got so sick of it doing this that I am now writing in my two star rating! I love HGTV, but come on just have your app work! Also I love how all the ads will stream perfectly but the actual show can’t seem to work and often is laggy 🙄 and it’s not my internet speed, I have 60 mbps. I hope someday you can make it work! I have enjoyed the content within this application. I haven’t had many issues while using and streaming with this app. It was my daily go to app for quick content, until they removed Apple Airplay. I do not want to ding them with a bad rating based on one app update launch. Since mirroring this app to my 3rd gen Apple TV is not a pleasurable experience. With the removal of Apple Airplay I will not use the app until it is reverted, which is sad. Where is the tv schedule? Won’t let me log in since the last update. Tried emailing and got a response that they don’t have enough people to monitor emails. Can’t use the app. Super sad. I have direct tv with the channel available and when I click on sign in the waiting icon shows, then it doesn’t do anything. Please bring back the airplay button! Also please add Charter to your cable provider list for Apple TV. App doesn’t work at all. Can’t sign in since it sends you through a endless loop. I want to love this app so bad because I love HGTV and was super excited to still be able to watch my shows after I cut cable but the quality is HORRIBLE!! It’s not even that it’s not HD (which it should be anyway); it literally looks like I’m watching shows on a flip phone from 2005. It’s also super glitchy...when I watch live tv it always freezes (almost ALWAYS right at the end when it’s the revealing of the new space) and it’s become so frustrating I don’t even feel like bothering anymore. Please fix this! Why did you remove AirPlay?!?! Why did you remove ability to rotate screen? Still buggy, still frustrating and now even worse that you removed airplay and rotate! Will probably get rid of the app because if you don’t have cable a majority of the shows are locked down. And HGTV doesn’t update the free shows so after about a month there’s nothing to watch! While I cannot say the latest update is a complete failure, most of the time the shows are blurry. Before you tell me it is my internet speed, please know that I have other apps that are working fine and previous to the update I had no issue with viewing our favorite shows. Please bring back the previous app version. This is the only app that has stopped playing and casting. I’ve tried removing the app and then reinstalling it but it doesn’t fix the problem. Keep getting “video failed to load”. It’s not my internet either! And I make sure I completely logged in. None of the videos work anymore, even the ones I’ve already watched. All my other apps work and cast just fine. I was loving the app until the latest update. They removed the AirPlay button, so now when I stream to my Apple TV it’s not full screen and it’s constantly losing connection. That never happened before. Not a good move. It shuts down after a minute of watching. It’s impossible to watch anything! It used to be that you would have three days or so, to watch a new episode without any commercials. Seven commercial breaks for a 43 minute show? Come on! Also, can’t minimize screen during commercials anymore. Really unfortunate! Why is the default layout in landscape mode? Please fix! The app is very buggy. This is the worst update ever. The previous version was better than this! Disappointed that apps are removing Airplay feature to stream through Apple TV. The screen mirror feature is small and poor quality. Please bring back the Airplay feature! The new version can only be watched on your IPAD one way, it wont flip to fit the screen when you turn your IPAD vertically. It is not very user friendly, you have to scroll through many seasons and screens to find a show when previously it would show many shows under one listing. Lastly, this version took away the apple TV icon and ability to stream to your tv. I liked the old version much better! This new version does not allow me to watch the episodes I want. It doesn’t work the same and now looks just as boring and works just as badly as the Discovery channel and Animal plant app. Bring back the old app! Can’t watch HGTV through Apple TV as It appears Spectrum/Apple TV OS/HGTV have not come to what ever agreement they need to come too. Up until this last HGTV app update, we were able to Airplay from our iPad. NOW, It appears HGTV took that option away. We are now reduced to mirroring. So flippen frustrating. I would bet it’s got something to do with the ole mighty dollar. Latest update a fail. App no longer works. Non-stop attempt to update is draining the battery. Would be 5 stars if it had support for airplay and chromecast. After the new update I was not able to cast it with the chrome cast! I usually stream the app from my phone to my tv using Apple AirPlay with my AppleTV. However since the new update it requires my phone to be unlocked to play on the tv through AirPlay. A big disappointment. Just got the new update. I love that I can watch old shows, however, I can no longer stream through my Apple TV. Will you be bringing that feature back? Streaming is slow or not able to view when casting on chromecast. Video is always interrupted when commercials go on, especially when watching live tv. The app always tries to jam commercials in and causing the stream to get stuck. 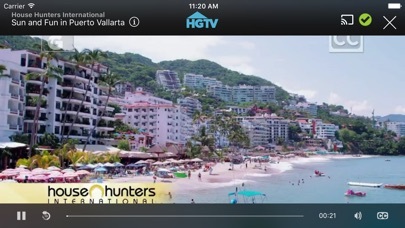 I have used the HGTV app on my iPad and Apple TV 4 for more than a year, having minimal issues. Over the past weeks, anytime I load the app on the Apple TV, it does not fully load before it completely crashes and goes back to the Apple TV home screen. We have tried several troubleshooting steps: Restarting through Settings; unplugging; deleting and reinstalling the HGTV app; signing out and back in to the HGTV app. In addition to these crashes, we are unable to play any of the videos on the iPad app either. The app will fully load (better than the Apple TV app), but when attempting to play an episode, I receive an error “Failed to Load Video.” Please update the app so it is useable again, or please explain why it can no longer be used with Verizon FIOS. Thank you. I love watching Hgtv everywhere I go. I can’t imagine missing any of my favorite shows. 27 year old’s dream come true. Signal to my tv is kind of sketchy....watched a show and sat through all those frickin commercials (seriously!) and got to the final segment then signal got weird and it jumped to the end. Can’t back up because the commercials which I already watched had to play again! Took ten minutes to see the last 3 mins of the show.... totally irritated! I have been a fan from the beginning and it is the channel I watch the most! So I am focusing on the facts that 97% of the families that are either purchasing homes or hosting on hgtv are majority white families which is clear how the banking system only approves the majority of white americans to purchase homes i rarely see latino, black or even asians families being able to experience “the american dream” being able to purchase a home. For example if a ethnic family looks to purchase a home banks will require about 7 co signers to get approval but of a white family looks to purchase a home pretty much instantly approved. These are facts and not opinion just ask hgtv and the banks what is the race home buying approval rate. And it will be clear that we live in a america that does not give equal opportunity. Me gusta mucho la app y el contenido. No se si HGTV de Canadá tenga algún programa diferente, sería interesante también se pudiera encontrar aquí. An app that doesn’t work. This app is garbage. It doesn’t allow for login insofar as it won’t even get past the service provider lookup stage. Works fun on the computer via their site. Get it working and I’ll change the star rating. It’s the 21st century, figure it out. It’s obnoxious that this app doesn’t play shows in chronological order. Watching the 2nd ep of a show? Well... the first episode will play next... why is it that only these Scripps apps do this?!?! I have deleted and uninstalled the app on both my iPhone and iPad, but no matter what I do every time I go to sign in the app crashes and says sign in is unavailable at this point in time. Until they fix whatever is happening the app is completely worthless. When you don’t have a cable provider. You should be able to watch more shows. I watched all the shows of ‘Flip or Flop’ and wanted at watch more but, they don’t let me watch any more. Great app you have FREE TV shows I use the app every day and watch FLIP OR FLOP on a daily basis.I think everyone should get this app all you have to do to sign in is simply select your network and enter your email to verify that you have the network.There is only one tiny thing that needs to be fixed there needs to be more shows.But other than that this app is AMAZING!! If you leave a video in the middle, it would be helpful to have a first screen asking, "Do you want to resume or start again?" IphoneX and have tried repeatedly to log into my provider and nothing happens. The App is not good! This app is atrocious. Episode are out of order and your place isn’t held for binging. When your ready for the next episode, the previous episode will play. Shows skip large segments. The app is amazing. I can use it on the go, I love it ! I counted from 5 to 10 commercials on every break. Ridiculous. Unable to use app because Sling isn’t included in the list of providers. No choice but to uninstall. I love this app! I have watched shows that I never even considered and weren’t easy to find on my television. Always something new, interesting and entertaining. The app doesn’t seem to work. I can see all the shows, but every time I try to watch something, the timer starts at the bottom and all I get is a black screen. Or sometimes I get to watch a Toyota ad, then nada. Glitchy app. Very disappointed. Boo. Apparently you can only watch shows in this network if you are using a major cable provider. The “More Providers” option suddenly stopped working in my phone and iPad. Extremely annoying. I love this app so much!!! I’m able to watch my favorite shows. The problem is the Live function freezes almost every 15 minutes and sometimes more. I have to stop casting to my tv and restart it to keep the show going. It didn’t use to do that!! I hate when it cuts out!! Doesn't have Love it or List it OR Flip or Flop. That's like a Food Network app not having Chopped. And there's only a few episodes of each show... what's the point? This app shows how little this company understands what app users want. The apps lay out design is horrific first and foremost. In a world when everyone has some form of amazon prime, Netflix, or Hulu app we all are so used to to the extremely easy video list lay out of this apps. It’s clear those apps have figured out how to display their content and probably isn’t a category anyone else should try to invent a better mouse trap for. That doesn’t stop the hgtv app from trying and they fail horribly. Every piece of video content is laid out in one straight line. Zero multiple rows for any sort of easier access. To make matters even worse it’s pretty embarrassing for Hulu to outshine and display your content better than you do. With Hulu the seasons of an hgtv series are easy displayed in season categories and in order by episode. Dive into the HGTV app and pick a show like fixer upper, for example, you not only have one random episode 7 of all episodes to pick for a specific season or you have the most recent, up to date, season being completely mixed up. Jumping from episode 15 to episode 3 to episode 12. Not even being in actual order. Then the ads on the app are horrific! Not only are they more repetitive than if I was actually watching the same channel on tv but you can’t skip them at all. Leaving yourself wondering why you would ever download this app in the first place to watch your favorite shows when you could just download them on your dish hopper hardrive and then jump on the dish anywhere app to fast forward every single commercial. It’d be a different story if you didn’t need a satellite tv subscription to sign into the all but you do. So to download tour tv provider app instead cause I bet it functions better and you can skip commercial. The horrific commercial experience doesn’t stop there. When we live in the world of digital content why would I ever spend 15 minutes watching commercials on the HGTV app when I can get a Hulu subscription and see zero commercials while watching the same show. Yet another way another app out does this one and that would embarrass the heck out of me if I were hgtv. The app is also very glitchy. I would never download it to my iPhone for the other choices I have above but decided to try it on my Apple TV. I had a loading issue with my 100mps perfect signal strength WiFi while watching an episode of fixer upper. Had to close out the entire app and relaunch it. When I did that the app asked if I wanted to resume from the moment I left off. Not only did it lose connection in the middle of a 2 minute commercial break but it then glitched our, deposits my resume choice, and sent me back to the beginning of the episode. This meant I had to watch 30 second commercial that you gave to see EVERY SINGLE EPISODE YOU WANT TO WATCH, before the episode even gets going, plus the 7 second hgtv logo animation which you’ll get so annoyed by seeing four episodes in to any series you’re trying to watch. Then after that 37 seconds of commercial and logo time I then had to manual scroll back to where I originally chose to be resumed from just to then be forced into another 2 minutes of unstoppable commercials before I was finally returned to my show. Miss something you want to see again right before the show goes to commercial? To bad! You can’t go back once the commercials have started. Did you wait for the commercials to end and then rewind to see the part you wanted to? Guess what you have to watch those same commercials all over again! So annoying! HGTV you seriously need to work on your app if you want to stay relevant and not turn off your fan base more than you turn it on with mistakes like this one. The apps lay out design is horrific first and foremost. In a world when everyone has some form of amazon prime, Netflix, or Hulu app we all are so used to to the extremely easy video list lay out of this apps. It’s clear those apps have figured out how to display their content and probably isn’t a category anyone else should try to invent a better mouse trap for. That doesn’t stop the hgtv app from trying and they fail horribly. Every piece of video content is laid out in one straight line. Zero multiple rows for any sort of easier access. To make matters even worse it’s pretty embarrassing for Hulu to outshine and display your content better than you do. With Hulu the seasons of an hgtv series are easy displayed in season categories and in order by episode. Dive into the HGTV app and pick a show like fixer upper, for example, you not only have one random episode 7 of all episodes to pick for a specific season or you have the most recent, up to date, season being completely mixed up. Jumping from episode 15 to episode 3 to episode 12. Not even being in actual order. Then the ads on the app are horrific! Not only are they more repetitive than if I was actually watching the same channel on tv but you can’t skip them at all. Leaving yourself wondering why you would ever download this app in the first place to watch your favorite shows when you could just download them on your dish hopper hardrive and then jump on the dish anywhere app to fast forward every single commercial. It’d be a different story if you didn’t need a satellite tv subscription to sign into the all but you do. So to download tour tv provider app instead cause I bet it functions better and you can skip commercial. The horrific commercial experience doesn’t stop there. When we live in the world of digital content why would I ever spend 15 minutes watching commercials on the HGTV app when I can get a Hulu subscription and see zero commercials while watching the same show. 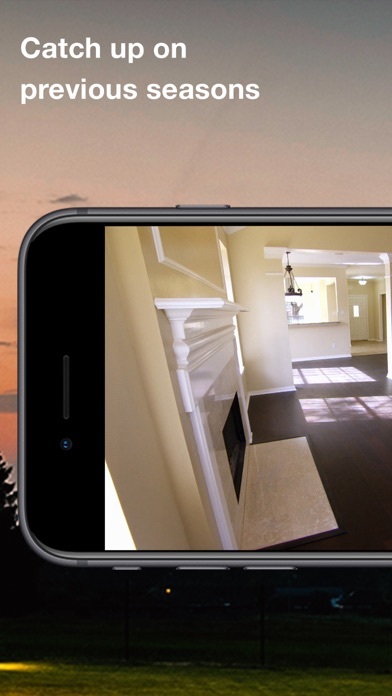 Yet another way another app out does this one and that would embarrass the heck out of me if I were hgtv. The app is also very glitchy. I would never download it to my iPhone for the other choices I have above but decided to try it on my Apple TV. I had a loading issue with my 100mps perfect signal strength WiFi while watching an episode of fixer upper. Had to close out the entire app and relaunch it. When I did that the app asked if I wanted to resume from the moment I left off. Not only did it lose connection in the middle of a 2 minute commercial break but it then glitched our, deposits my resume choice, and sent me back to the beginning of the episode. This meant I had to watch 30 second commercial that you gave to see EVERY SINGLE EPISODE YOU WANT TO WATCH, before the episode even gets going, plus the 7 second hgtv logo animation which you’ll get so annoyed by seeing four episodes in to any series you’re trying to watch. Then after that 37 seconds of commercial and logo time I then had to manual scroll back to where I originally chose to be resumed from just to then be forced into another 2 minutes of unstoppable commercials before I was finally returned to my show. HGTV you seriously need to work on your app if you want to stay relevant and not turn off your fan base more than you turn it on with mistakes like this one. Every time I try and cast the app I take a chance that I might get 15 mins into a really interesting episode and boom fight with the app for few minutes till I give up and watch another app that stays connected to chromecast. Please fix the problem. It only happens with HGTV. I love all thing hgtv. It is the best therapy. The content is great and as expected. The streaming service is terrible. Over half the time the shows do not play. Just get the loading icon in the middle of the screen. Please fix this problem. I absolutely adore most of the shows on this app. I just find myself not using it as much as I thought I would be because the commercial breaks are a little too frequent for me. I was watching an episode of Good Bones which was 43 mins and ended up getting 4 commercial breaks with 5 commercials each break. That’s 20 commercials for a 43 minute show, and most of the commercials are the exact same every break. It just started to feel a little bit like I was watching more for the commercials than the show. Like I stated before, I love the shows on this app. For the most part the app is great too, but the commercials really make me question how bad I want to watch the shows through this app. HGTV is part of my daily life, with so many different shows and locations it’s never boring. And who needs a decorator when we can pick the brains of so many diverse and talented people on HGTV? Five stars really aren’t enough! This ap was great until this week. It won’t let me sign in with my provider. The “other Tv providers” button doesn’t work. Please fix it so I can enjoy this again. Doesn't cast well with google. I can’t believe how terrible the Apple TV app is. Unintuitive, weird scrolling, confusing categories. But the worst thing is the auto playing. I’m scrolling through and the app suddenly goes black as it tries to auto play a show I haven’t chosen. And there’s no way to turn it off! It’s rage inducing. Should be able to download episodes to watch without WiFi. I was hoping to be able to download with this app. You must make it to where your phone’s screen stays on in order to watch a show. Also you can’t multi-task while watching a show while streaming to Apple TV. I love HGTV but can not get the Live Stream to stay on for more than one or two episodes on my phone or when casting to one of our other TVs. Even our Fire Stick cuts out. I know it’s this app in particular because no other channel apps do this. Whenever I try to watch a show all I can see is the advertisement. I can watch the show currently showing, access the schedule but whenever I try to see other shows I get an ad and then nothing after. Not sure what “can’t authenticate with my provider”means?? I have Spectrum/Time Warner- use that app ALL THE TIME so not sure why I can’t log on. I will try back in a couple of days and if doesn’t work, I will delete the app. The HGTV app has so many bugs, on my fire stick and on my phone it will just reset itself and send me home, or just stop playback altogether. Just discovered this funny/dynamic couple! When I go in to look at a show it closes out of the app a lot. I have to re open the episode a few times before I can get it to load. Seems like every week I have to redo the activation code. Not sure if the problem is with Apple TV or my cable provider but it’s annoying! I’m not sure what changed but we used to enjoy this app often up until a couple months ago. So the banner overlay at the top that displays : Home Love TV Shows Search and Settings is stuck at the top of our screen. All the way to the right side it displays Done and green circle with a check mark. The banner is well over 5” and eats up way too much of our tv to even enjoy it. We have tried deleting it to install it again. We have signed out and back in again to no avail. I hope this bug is fixed soon as we miss watching our favorite shows!! Great app except for a major flaw. On Roku episodes will restart whenever the time changes to a new hour.... so if you start a house hunters at 10:50, at 11:00 it will automatically restart that episode, causing you to have to fast forward and find your spot.... this has been an error since they redesigned the app. Too many commercials and then starts playing an episode of another show! I’ve tried numerous times to watch White House Christmas Tour and once I get towards the end, after watching 6 minutes of commercials in one commercial break (so add that up through the entire show and it’s a LOT!) suddenly Genevieve comes on! I give up, maybe someone has it on YouTube.. PLEASE! Get better at your advertising!!! I don’t mind watching a commercial or two, you’ve got to pay the bills, but watching the SAME commercial over and over again is seriously annoying. PLEASE add some variety. I really am frustrated with the new update. First. At one point I had direct tv, but we swiped to AT&T u-verse. Now the app won’t update automatically to my new provider. Each time I use the app, I have to go to FAQ choose not seeing my provider and it goes to the right one. Next. It’s not really an app but appears to be in safari as though I’m accessing through safari and not the hgtv app, and it’s not nearly as friendly or nice as the previous app. Consequently, where I used to watch this everyday with my coffee, I generally only watch hgtv once a week. Please fix it. Thanks. This year the White House reflects the true class it has lacked for the past 8 years. Timeless beauty and classic elegance!! The fine simple touches are amazing!! Kudos to the volunteers and to the TRUMPS for bringing back the LOVE OF COUNTRY TO AMERICA!!! MERRY CHRISTMAS!!!!!!!! Quit cutting the full episodes short! This is typically my go to app if I have some “free” time somewhere. Lately though all the full episodes are cut short by a couple minutes. What’s the point of watching if I can’t watch until the end?? Please fix this! Need a provider... Soooo NOT FREE! This app is no longer support airplay an essential feature for Apple users with an older Apple TV especially. I can airplay mirror with that shrinks the size of my video. This is a great app. I thoroughly enjoy having all of the great shows on demand. The AppleTV app is basically useless. Why offer the option of Live TV if it’s not going to work? The interface is annoying and clunky. Terrible, terrible, terrible. I love this app, but there’s one thing...too many commercial breaks, and ads. When I watch Love it or List it there’s like 7 commercial breaks, and they’re very long ones. Feels like the Daleks have a new objective - prompt subscribers for their credentials often enough to demonstrate that annoyance before you watch the ad before you watch your program is part of the fun. It isn’t. I’m the same idiot I was when watching yesterday. Likely the day before. Perhaps even the Tuesday before that. And even last Groundhog Day. Prompting for credentials for something paid for on the same device over and over isn’t helpful to the customer, and one must doubt it helps HGTV. I live in Florida and both of my cable providers are not listed to be able to use this app: Brighouse and spectrum. Stopped working! All the time! Very frustrating! Will not let me sign in! Does this all the time! Always in the middle of watching a show! Not happy! I watch this as a break from bad news, violent and stupid shows. Xfinity ads during Halloween season were disgusting. Trailers from shows/movies are not what I want to see. Feels like 20% content with 80% ads. I’m a big fan of HGTV programming, and would tolerate a few ads. However, due to the sheer amount of ads and the fact that the same ads run over and over again, I removed the app from my devices. They fixed the Hulu login issues, great! Now they need to fix the auto play. 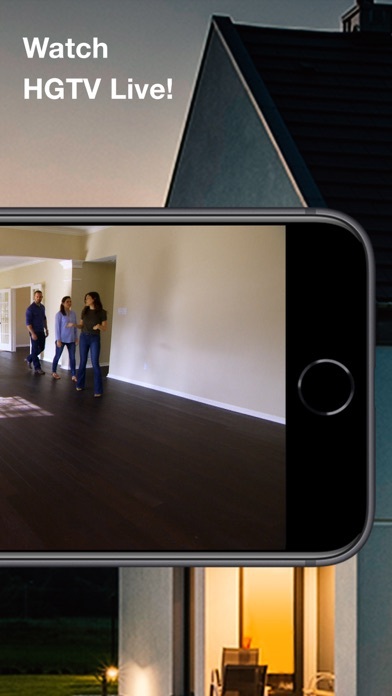 Watch the newest episode of Flip or Flop, and then you’re watching Fixer Upper and it’s been added to the TV app now playing list. If I wanted it added, I would have added it. Please allow an option to turn off auto play! It totally breaks the TV.app integration on Apple TV. I don’t have a TV provider and I’m willing to pay a monthly fee just to watch HGTV. Why haven’t you made this an option yet. Working very well on iPad. Bad on Apple TV devices thus SSO problematic. Don’t try use Hulu Live TV provider credentials for this apps on Apple TV devices. 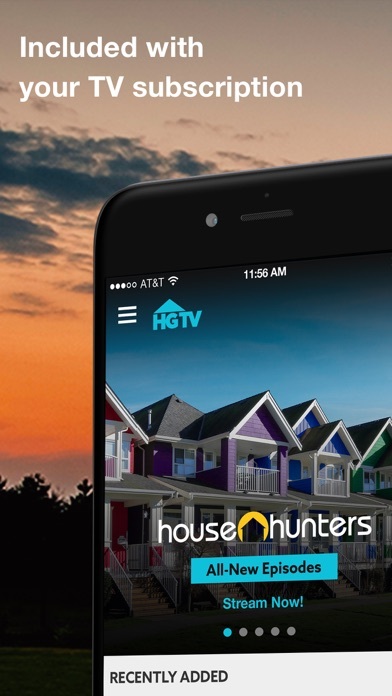 Get the HGTV app and watch your favorite shows for free. Not true since you need a provider. There are some shows to stream for free but not that many. There are so many commercials, you would think, they could steam all for free. The app was easy to launch and view selected TV shows through my cable provider. I have been pleased that I haven’t experienced any streaming disruptions. What junk. The whole premise is to let cable subscribers use this and the login feature shows no providers other than the eight or so that paid to be seen. What a joke. Will not allow me to select Orbitel as my cable supplier. It will not pull them up on the available list but they are an available cable company. I was able to set it up on the web as well as with a droid phone. App needs to be fixed. In trying to sign into my cable provider, no more providers showed up. Had to turn off HGTV under TV Provider in settings to get it to work properly. Such a love hate relationship with this app. I love hgtv and being able to watch anywhere anytime but so few to watch and they come and go so quickly! I also can't get over the fact that the end of every single one is cut off. I hate that soooooo much. I need the end! I hate 2 minute clip. What's the point?? Make me think I have 20 episodes to watch oh nope, Only 3 are longer then 2 minutes. Recently had problems signing in and contacted customer support. I was told to go to settings on my phone and look up tv provider and then toggle off the hgtv button. After closing out the hgtv app and reopening, I was then able to find my provider and sign in. Thanks customer support. Signed thru my service provider Suddenlink on day I downloaded app watched a show next day try to sign to my provider and Suddenlink does not exist on provider list. Not worth time to download! Latest update ruined the app for me. Me and my girlfriend love this app. The latest iOS update to the app ruined it for us. We have directv now and now it gives an error message saying the shows are not part of my subscription. What the hell is that. I have the go big plan which includes this channel. Why is the stand alone app not letting me watch the shows I pay a monthly subscription to access through my provider? This doesn’t make sense to me. I’ll uninstall the app until they fix it. That’s just BS. I rated 3 stars because I like their shows but the fact that they blocked 99% of the content we used to watch for free before is BS. This app has been brilliant - my go-to at the end of the week. Until today, when I updated the app and now can’t watch anything. I sign in, but every show is locked. And there is no easy way to speak to someone to get this resolved. Was working for me and then the other day red keys appeared on almost all content. Logged off and logged back in with my provider, direct tv now. Said success when I logged in. I get all red keys though and a can’t authenticate error. I’ve seen other users reporting the same problem. Happens on all my iOS and tvOS devices. It doesn’t work. When I click on the program I would like to view, it gets stuck on the black screen with the spinning circle. Every couple of minutes, you have to watch the same 5 ads over and over again. It’s so annoying. Please stop with the frequency of the ads. It makes me want to stop using this app. Normally I love this app. But for some reason right now when I click on more providers nothing happens. I tried uninstalling and reinstalling the app and it did not help. I previously was able to watch the shows through my cable provider. Now it only lists 8 providers and the More Providers button does not work. Very frustrating. Was a 5 Star and when fixed will return to 5 Star. When all the other channels have the same old same old, I go to HG to discover more about the world.. thank you!! When trying to sign into tv provider, it won’t allow me too. Even though in settings it’s linked and when I download the app it asks for permissions, it is requiring I sign in. It only gives around 8 providers. When I click the ‘more providers’ link, it doesn’t work. Frustrating. When it did work, I loved the app. Can’t pull up list of other providers. So, yeah, useless. I have used this app for over 3 years. I have updated all my devices. Killed this app and then reloaded. It no longer allows me to search my provider,Suddenlink, or any other provider that is not provided on their front page to sign in. With all the reruns though I really probably not missing much. It's had issues since they updated it, the first of Sept. Apparently the first of Oct 2017 (they said) they have killed the bugs.. They need a new can of raid, it still stinks. NO LONGER USER FRIENDLY. You no longer have a choice of episodes to watch. Nor can I get it "live". Don't understand that one as I do have cable. I can say good bye as all they do is spin off after spin offs. How many house hunters and flip or flops can we stomach. Typical break makes you watch 6 commercials and there is definitely more than one break. To add insult to injury they repeat the same commercial over and over and over.... not a bad app at all but OMG enough with the commercials! Look into offering a limited commercial and/or no commercial option. Also, many are moving away from cable TV and yet that’s the only way to get access to your app - I would change that up. Missing a large segment of people. Every program I tried to watch/listen to echoed, so badly I couldn’t stand to listen to it. I’d turn my iPad on mute, but what’s the fun of just watching if you can’t listen? Needless to say, I’m very disappointed. I used to be able to watch my favorite shows on hgtv via firestick. Last Sunday I hit update on the hgtv app. Ever since then I cannot watch any of my shows on HGTV as there is a key sign. Called Spectrum three times and still nothing. What the heck happened? Love the app EXCEPT for when my favorites disappear after every app update and/or Apple software update. It’s very frustrating having to recall all episodes marked to watch later. I’ve had Direct Tv Now for almost a year and have been able to use my Direct Tv Now subscription and link it with my HGTV app. The app says my DTN subscription does not allow me to access this content. I have the second tier (live a little I think is what it’s called) and DTN says that my subscription does let me have access to the HGTV app. It’s also on there list of apps accessible with subscription. The app has red keys besides almost all of the shows. I’ve always had access until about 2 weeks ago. So I don’t if it has anything to do with there update or if their blocking DTN customers?? I contacted DTN and they put a ticket in but I have not heard anything back. Getting very frustrated. My wife watches this channel the most out of all our other channels!!! There is only so much chip and joanna gains that you can watch before it just becomes old hat!! Really wish they would get this fixed!!!! This app is a headache. I have tried logging in with directv now countless times and it tells me the password is wrong. So I reset the password through the app and then it let me log in. It only showed me my account but did it unlock the episodes. Then when I went out it still said sign in. When I sign in again it says the password is wrong...AGAIN. Not many episodes for each of the shows. I didn’t have any issues with signing on. My biggest complaint are the commercials! Look, I’m paying to watch your shows and when I record them on my dvr I can fast forward thru commercials. Have the courtesy to limit how many you FORCE us to watch! You cannot think people will stay with your app when you don’t list your whole catalogue and make us watch commercials that account for about 20% of the total run time. Crashing and crashing and crashing! Constantly crashes. Connects just fine but will only stay connected for about a minute or two before the connection fails or the app crashes. SHOWS END EARLY....30 MORE SECONDS PLEASE!!!! I love this app. It lets me watch my favorite shows anywhere. The only reason that I did not give it 5 stars is because the final mommy's of the shows cut off before the show ends. Many of the shows on HGTV tell you whether or not a house sold or the sales price of a home in the final moments of the show. This app cuts off before that information is given. Too many commercials. I never even saw the show! Why so many flip shows. Can you bring back show like design on a dime. I enjoy Brooks and Mortar. Will there be more than one episode? It was working fine until I changed tv / internet providers, but the app won’t let me change it, so I can’t watch any full episodes (just the end-of-episode recaps). I changed it on my iPhone, didn’t affect the app. I deleted the app a few times, still won’t change. I tried signing out of the app, won’t let me. PLEASE FIX! Doesn't support DirecTV Now activation. Neither the iPad, iPhone nor Apple TV versions of this app support activation through DirecTV Now -- not to be confused with satellite-based DirecTV -- which almost all other popular channels already do. Please add support for DirecTV Now soon! I have entered my TV provider on my iOS device, with HGTV enabled... yet the app will not recognize my login AND will not allow me to enter my TV provider in the app because it only shows the top 8 or so. When I click on "more providers" it says it doesn't recognize my provider. (My provider IS listed in other providers on HGTV.com.) Super frustrated. (FYI, things also are not working when I try to watch on my MacBook entering my TV provider info.) Problems abound. But, it will not allow it to connect to COX cable... It use to. How sad a cable company can over ride an app I choose for my personal enjoyment!! Very aggravating! Giving this a one star because it does not include DirectTV Now in the TV provider list. Most other apps support it now. Everytime I’m going to turn my phone sideways to make the screen bigger, the app crashes. I LOVE HGTV so having it in an app is wonderful. Only negative is I would love more show options too.